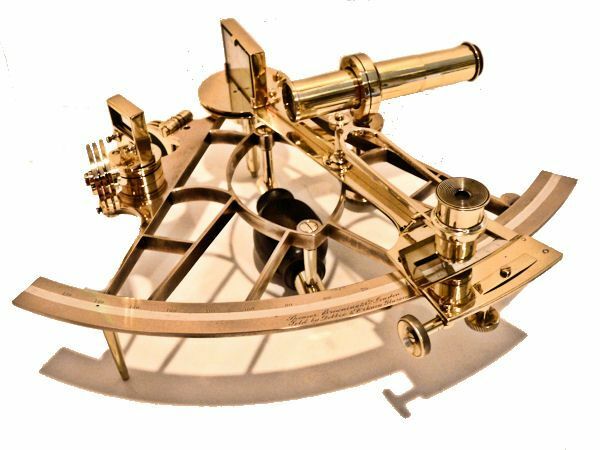 To view our current inventory of antique sextants, octants and navigation instruments, click here! This Rare and Wonderful Instrument Has Been Sold. Thank you! 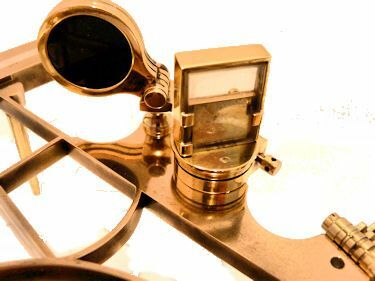 PRESENTED is a very rare Mid 19th Century brass, Plum shaped frame quintant reading to 150° along a graduated platinum arc with vernier, and brass fittings. Engraved at mid-center at the bottom of the arc in early Copper Plate Script is, "Spencer Browning & Co. London" above "Sold by Dobbie & Orkiney, Glasgow. The serial number 5276 is above 75°. This company was the sucessor by change in name to the famous Spencer, Browning & Rust and both were acknowledged as two of England's foremost early instrument makers and ranked alongside Throughton Brothers. 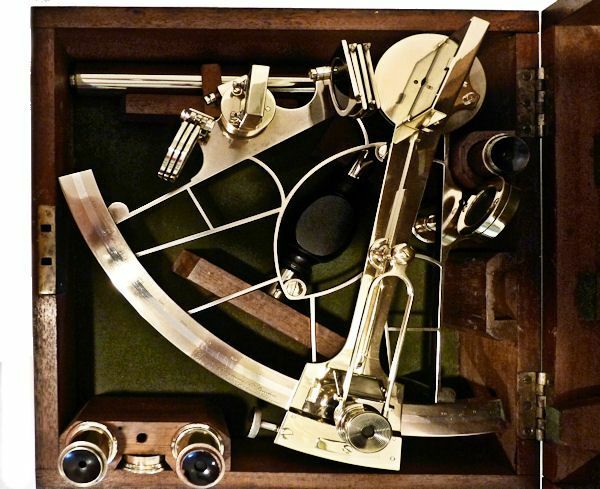 It comes with a high powered telescope for colllimation, a star scope, a sighting tube and an extension tube, and is housed in a beautiful Mahogany box with a pleasing patina. S.B. 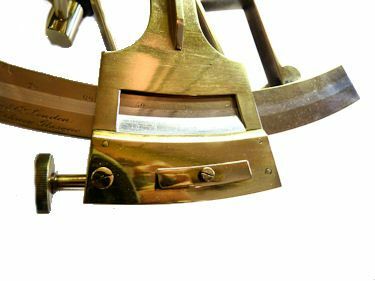 & Co. beg to caution the public generally, more particularly of Liverpool and the United States of America, against Instruments (sextants and quadrants especially) having a portion of the name of their firm (Spencer and Co.) put on them. The advertisers are responsible only for the quality of those having the full name "Spencer, Browning and Co." the house having now enjoyed a reputation second to none for the superiority of their Nautical and other instruments for eighty years, of which unprincipled manufacturers have been for some time taking surreptitious advantage. The genuineness of S.B. and Co.s Quadrants may be tested by the letters S.B.R. (connected) being stamped on the arc, to imitate which is actionable. 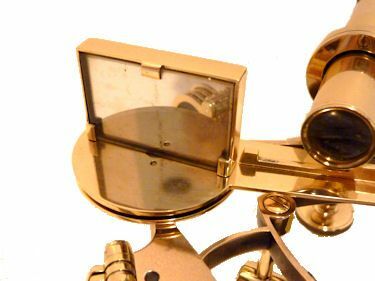 FURTHER REFERENCES: Spencer, Browning & Co. is made mention of on page 64 and 69 of the epic book, "Sextants at Greenwich", by Bruyns, which catalogs the collection of the British National Maritime Museum at Greenwich, England. Spencer Browning Rust worked in London from 1724 to 1840 when the name was changed to Spencer Browning & Co. after the death of Ebenezer Rust. The successor, Spencer Browning, had offices at a number of addresses on Wapping High Street, London, and were in business until 1870. Ref: Gloria Clifton, Directory of British Scientific Instrument Makers 1550-1851 (London, 1995), p. 261. INSTRUMENT CONDITION: There is an extra extesnion tube for use with the high powered scope. The index mirror is in excellent condition and the horizon mirror is slightly hazy. The beautifully turned Ebony handle is perfect. The index arm clamp, and swing arm magnifier are complete and in good working order. Both sets of shades, i.e., filters are complete without imperfections. Missing are a tiny screw driver for the miors and a pick for the turntable. It was recently polished and lacquered to show its beautiful workmanship. 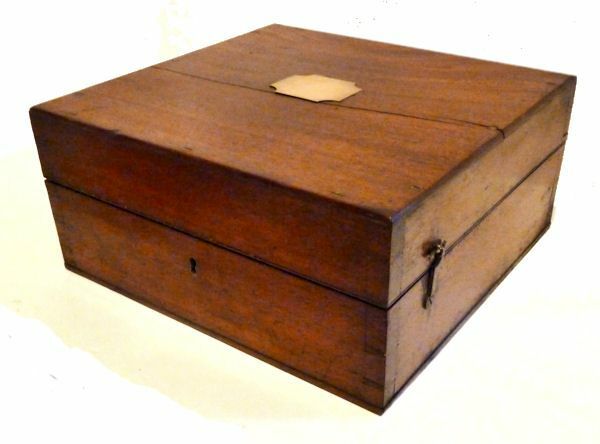 This instrument is in overall excellent condition and is suitable for a high quality collection of instruments or as a important gift. CASE: The square case has an age crack across the top, but is sound. And the brass scalloped insert, which is normally missing, is present. The instrument and it's accessories are housed in holders. There are two latches and a lock, but no key, and no handle. It has a wonderful old patina that only comes with natural aging. Expect the normal nicks and scrapes from years of use. Missing are a thin screwdriver and a small pick. The polished arc and platinum scale is calibrated -5 to +150 degrees with a vernier scale reading from the right from 0 to 10 arc seconds in 2 arc second intervals. The quintant has four partialy rounded shades for the index mirror and three round shades for the horizon mirror. 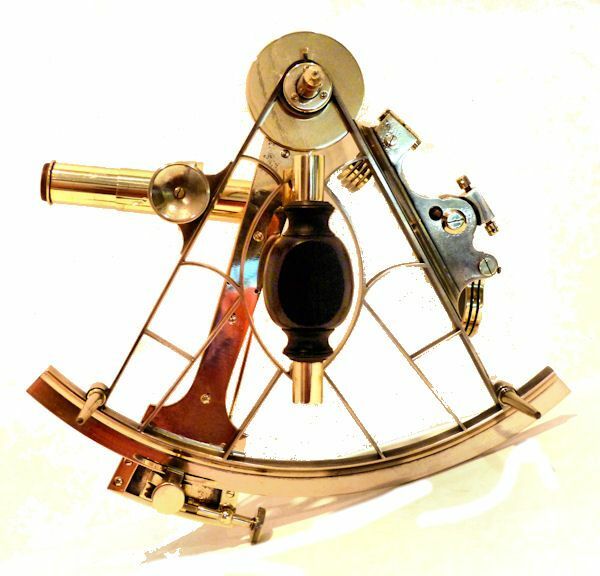 The telescope's distance from the frame may be adjusted by turning a knob at the back of the rising piece. 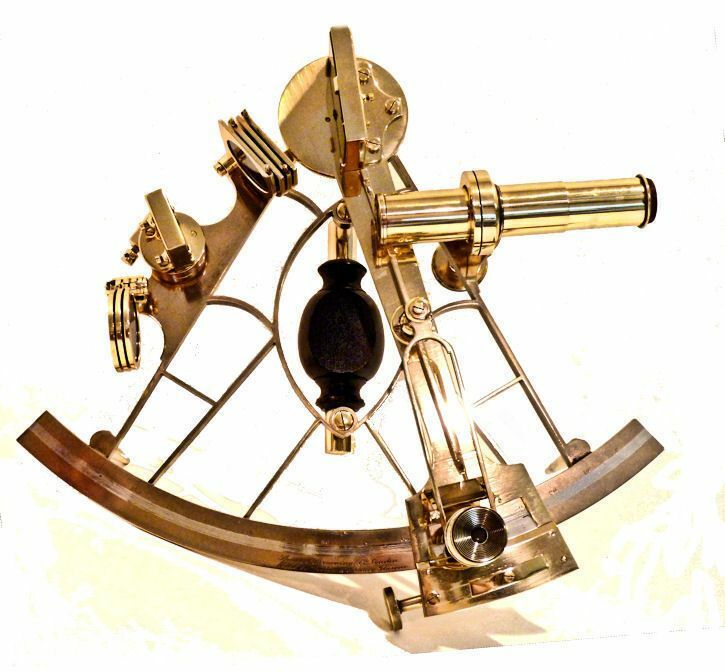 Machinery showing swing arm magnifier, and adjustable telescope mount. CERTIFICATE: There is no certificate which is customary with antique instruments. All in all, a highly desirable and exceptionable example from one of the best known English instrument makers. Length of index arm 9 3/4"
Radius of index arm 8 3/4"
Width of frame at arc 10 1/2"
Case 10" x10 3/4" x 4 7/8"
OUR UNCONDITIONAL NO NONSENSE GUARANTEE: If not completely satisfied with your purchase it may be returned, if without damage, within three days of receipt in its original condition and packaging. Returns must be insured for their full value. All that is required is a prior email authorization by us for the return. The cost of shipping, packaging and handling within the continental United States will be refunded if we are at fault. International buyers welcome, but inquire first. We have satisfied customers in Argentina, Australia, Austria, Belgium, Bermuda, British Virgin Islands, Canada, Chile, China, Czech Republic, Democratic Republic of Congo, Denmark, Dubai, Estonia, England, France, Germany, Greece, Holland, Hong Kong, Hungary, Iceland, Indonesia, Ireland, Israel, Italy, Japan, Kuwait, Latvia, Luxembourg, Malaysia, Martinique, Mexico, New Zealand, Nigeria, Norway, Nova Scotia, Panama, Philippines, Poland, Portugal, Puerto Rico, Romania, Russia, Saudi Arabia, Scotland, Singapore, South Africa, Spain, St. Maarten, Sweden, Switzerland, Thailand, Turkey, United Arab Emirates, USVI and the Eastern Caribbean. 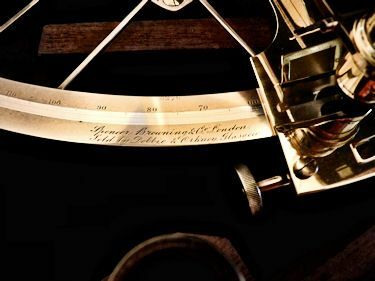 This is a very special and important navigation instrument. With its polished finish, and quality case it is perfect for a gift or in a collection of rare antique instruments. ACCEPTED FORMS OF PAYMENT are Bank wire transfer, cashier's check, or personal check in which case the item will be held until cleared. Our prices are quoted net to seller, but credit cards may be accepted through PayPal for verified members by special arrangement.